It doesn’t matter if you’ve lived in the city your whole life or now find yourself living here for college– Philadelphia is a beautiful place. I know that every time I take regional rail home to Germantown, I peak out my window when I get past Temple station to look in awe at the skyline. All of the buildings, small and tall, are mighty impressive! 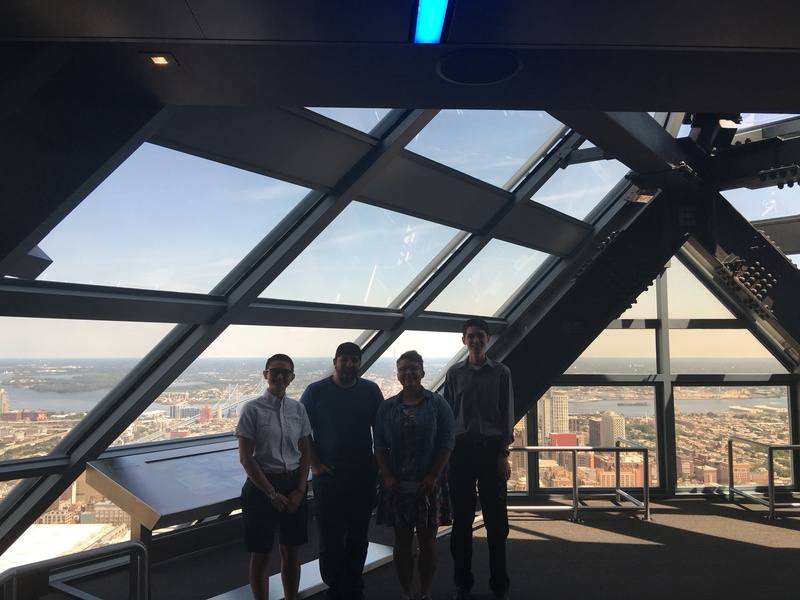 For this month’s SEPTAdventure, the SEPTA YAC took a trip to the One Liberty Observation Deck. The Observation Deck is currently part of SEPTA Pass Perks! They are offering $5.00 off of admission of you bring in a monthly, weekly, or daily pass! One Liberty Observation Deck is located in Center City at 1650 Market Street, which makes it very accessible using SEPTA. Suburban station is a block away and 15th street station of MFL and 15th and 19th street station of the trolley are all two blocks away. The 16th and Market bus stop, which is a few steps away from the Observation Deck, is a stop on routes 124, 17, 2, 32, 48, 38, 44, 33, 62, 125, 551, and 31. It’s pretty simple to get to the Observation Deck no matter what service you take, and, in all cases, the walk will be pretty short too! The SEPTA YAC had a really great time at the Observation Deck. I was expecting for us to enjoy the sites for maybe half an hour, but we ended up spending over two hours looking out over Philadelphia! We all were completely enthralled in the city below us, and all of us live in Philadelphia! This is not just a tourist attraction my friends. It’s actually more enjoyable when you know the city and you can pick out certain buildings and locations. There is also a really cool interactive map on which you can find famous buildings. We went in the afternoon of an August day, but Liberty One Observation Deck is open 10:00am to 10:00pm all year long, so you can watch the first snow fall, or the sunset, or the moon over Philadelphia, whatever you please! Everyone, do yourself a favor and check out the Liberty One Observation Deck!